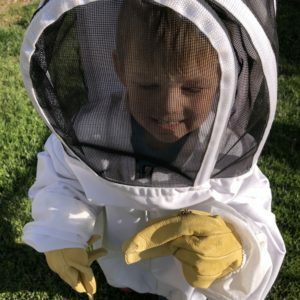 Bee Master Of Las Vegas, Inc. has been operating in Las Vegas for over 18 years now. 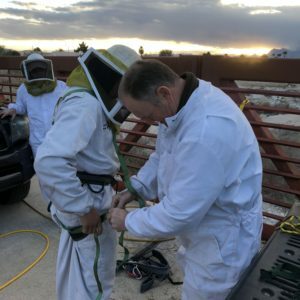 We have built an outstanding reputation in the Las Vegas valley as the leader in Africanized Honey Bee (AHB) removal. We are a pest removal company that is licensed and insured. We have had several great references over the years that are available upon request. We are also proud to offer great warranties for all of our services. We are pleased to be a part of the team in the valley that combats the AHB. We have assisted the Las Vegas fire Department and Metro on many dangerous and life threatening bee removals. We have been featured on many valley TV news programs warning and teaching the public about the AHB and how we can protect ourselves. We are most pleased to have been a part of the program “Living with Nature” on the Las Vegas cable station. The Africanized honey bee (AHB) is a truly remarkable honey bee from a scientific prospective but from a home-owners prospective she is a nuisance. The AHB will swarm (reproductive units) 10 times more than our traditional European Honey Bee (EHB). This means each person in an AHB area is 10 times more likely to interact with these insects. Most of our interactions with these insects are harmless and all attacks and deaths from AHB could have been prevented. The AHB is not a killer or a hunter she is only trying to defend her hive, young, and food. If provoked, the AHB will defend her hive with large numbers of bees. Up to 60% of her hive numbers, that can be anywhere from 30,000 to 60,000 bees or more. The AHB’s habits are very much the same as our EHB. Most people will see these insects flying from flower to flower gathering nectar and pollen. Others may see them coming to pools or ponds for water. Just as with EHB, enjoy these bees as they do their jobs. These situations are harmless and are meant to be enjoyed. Water foragers can be a nuisance if they are in pool areas where people play. Water foragers in the city can most often be tracked back to the source and controlled. Call Bee Master Of Las Vegas, Inc. for help. The AHB will nest almost any where a cavity is present. We have seen the AHB nest in water or irrigation boxes, tires, block walls, bird houses, outdoor speaker, boats, cars, house attics, old trees, crates, cardboard boxes, storage shed, wood floors, turned over pots, abandoned furniture, and so on. Keeping yards clean and property in good repair will help but not completely eliminate your chance of infestation. The most important thing we can do to protect our property and selves is inspect house and yard once a week. Quick detection and control is the way to BEE SAFE!